Install Google Earth Desktop. It's free. Download it here. Need help? Check out the Google Earth help docs. Once Google Earth Opens and the guide launches, select which layer(s) you would like to display. As layers are selected, various icons will appear on the map. Click map icons to see additional details. 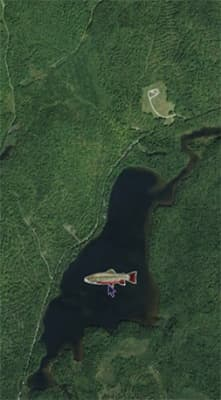 The Maine Fishing Guide Google Earth Data Layers were developed by the Fisheries Division of the Maine Department of Inland Fisheries and Wildlife to help anglers locate sportfish populations in lakes and ponds throughout the state and plan their outdoor adventures. 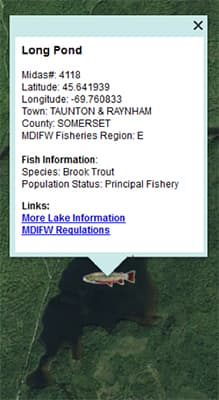 The app includes a sportfish data layer plus several other data layers developed by MDIFW, other State agencies, and private entities. We update this data periodically, and welcome feedback and requests for new layers from the angling community. We will periodically update the guide. To ensure you have the most recent copy, check the update date at the top of this page. You should download a new copy if the date at the top of this page is more recent than that of your last download. Before downloading an updated version from our website, make sure you delete the old layers from your computer. To delete your current version, right-click the "Maine Fishing Guide" text within Google Earth, then click "delete". You're now ready to install the newest version. Follow the installation directions at the top of this page. Not a software product or service - MDIFW is only providing data to be used within the Google Earth application on a user's computer. We are not responsible for installing or maintaining Google Earth software products. Accuracy limits - Google Earth imagery dates do not necessarily represent the date the image was captured, but show the date the imagery was processed and deployed. All information depicted is as accurate as available data allows. This data is for visual representation only, and may not contain all available data. 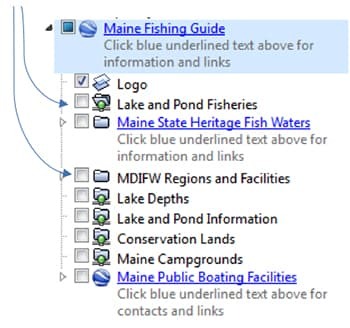 Third party data - While we have tried to use or work with reputable associations, data layers pertaining to private entities are for planning purposes only and do not represent any endorsement by the State of Maine or the Department of Inland Fisheries and Wildlife. Questions, comments, or suggestions? Contact Us.